Pepper & Chocolate: Simple complexity: Wood Casting. Blending the purity of modern design and and the complex roughness of natural matter might be the one thing that characterizes Hilla Shamia, an Israel based designer. 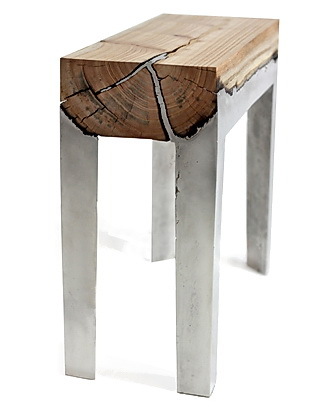 It is not the first time that we present you a chair or a bench but there is something unique about this creation called “Wood casting”. What you are looking at is simply molten aluminium poured over a whole tree trunk. The aesthetic born from the contrast of the metal sharp edges and the very natural curves is just as interesting as the warm tone of the wood against the cold metal. 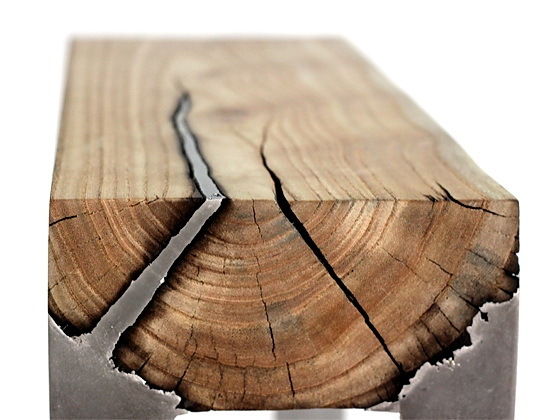 The interface between the two materials is accentuated by the wood burnt by the heat of the liquid aluminum. Seats, high chairs and other items compose this collection. You will be able to see Hilla Shamia’s creation at Milan design week 2012, April 17 to 22.